The results of a survey of more than 700 campus protection professionals reveals the median salaries for a wide range of K-12, university and healthcare public safety, security and emergency management personnel. The results also include data on staffing issues in hospitals, schools and universities. CORRECTION: The original version of this article had a typo in the “Median nonsworn officer starting pay by U.S. region” chart. The original chart indicated nonsworn officers in the West received the highest starting salaries. That was incorrect. Nonsworn officers in the Northeast are paid the highest at $32,500. The new chart, which can be found here, has the correct data. If you are a sworn campus police officer, chief of police or security director, more likely than not your annual salary has increased since 2015, which is the last time Campus Safety magazine conducted its Salary Survey. 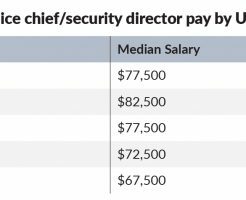 The overall annual median income for hospital, school and university police chiefs and security directors has increased from $72,500 in 2015 to $77,500 today, which is nearly a 7 percent increase. 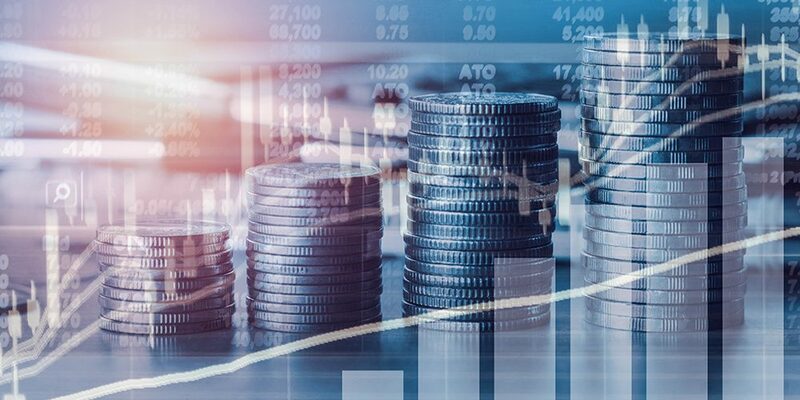 That rise in income is slightly ahead of the rate of inflation, which is projected to be 5.8 percent from 2016-2018 (1.3 percent in 2016, 2.1 percent in 2017 and 2.5 percent this year [projected]). The rate of increase for novice sworn officers is even better, at 13 percent. Three years ago, the median salary for such officers was $37,500. Now it’s $42,500, with 34 percent of respondents saying that their sworn officers make more than $45,000 per year as a starting salary. In 2015, only 19 percent made that amount. The picture isn’t so bright for nonsworn campus officers, however. Their median starting pay rate has not increased since 2015, remaining at $27,500. That being said, 63 percent now make more than $25,000 as a starting yearly salary. CS’ last survey found that only 51 percent made that amount. The region where your campus is located is a factor in your annual pay rate. 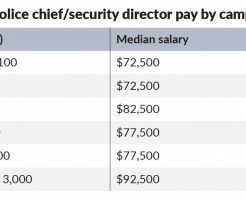 Police chiefs/security directors and starting sworn police officers in the West tend to be paid more than those in other areas of the country. The median salary for chiefs/directors in the West is $82,500, while in the South it’s only $72,500. In the Midwest, it’s even lower, at $67,500. Sworn officers who are in the West make a median starting salary of $47,500, while those who work in the Northeast and Midwest make only $42,500. If you are a sworn officer in the South, your starting pay is most likely the lowest, at $32,500. For nonsworn officers, however, the median starting salary is the highest in the Northeast ($32,500). Once again, nonsworn officers in the South take home the smallest paychecks ($23,750 per year). On the benefits front, nonsworn personnel are struggling. In the past three years, university, school and hospital nonsworn officers have as a whole experienced a decline in the benefits and incentives they receive, particularly in education benefits for themselves (an 8 percent decrease) and their families (6 percent), as well as uniform allowances (7 percent). Only 2 percent received more bonuses than the last time CS conducted its salary survey in 2015. Benefits for sworn officers appear to be holding somewhat steady. That said, the most significant changes to sworn officer benefits and incentives involve the decrease in education benefits for officer family members (8 percent), as well as officer fitness benefits (6 percent). The gender and minority/racial makeup of campus public safety, security and emergency management departments is practically identical to what it was in 2015. That said, 4 percent more of this year’s survey respondents are minorities, and 5 percent more respondents who are chiefs of police, security directors, deputy chiefs or assistant directors are minorities. Additionally, 18 percent of this year’s survey participants are women — that’s five percentage points higher than three years ago. Furthermore, 4 percent more respondents who are chiefs of police and security directors are women, for a total of 14 percent. 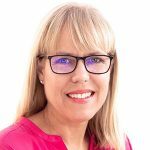 Female chiefs and directors, however, have a ways to go to bridge the wage gap. The median salary for them is $67,500, compared to $77,500 for male chiefs and directors. Interestingly, this year’s chiefs and director respondents who identify as minorities have a median salary of $77,500, which is $5,000 more than white chiefs/ directors ($72,500). Understaffing continues to pose a significant issue for hospital, school and university public safety, security and emergency management departments. Although there have been incremental improvements overall for sworn officers and other department employee levels, more than four out of five departments in the South say they don’t have enough sworn officers. There has also been some backsliding in nonsworn officer levels. Now, 73 percent of all survey respondents say they don’t have enough nonsworn security/ public safety officers. That’s an increase of 5 percent compared to 2015. Nonsworn staffing issues are particularly troublesome in the Midwest (77 percent) and West (77 percent), while “other department staff” issues are most challenging in the West (76 percent). Most respondents who say their hospital, school or university public safety department is understaffed believe they need an increase in personnel of 1-30 percent. Another interesting point that the CS 2018 Salary Survey uncovered is that the weapons status of hospital, school and university public safety officers hasn’t changed much since 2015. There has been just a slight shift from officers only carrying less-lethal weapons three years ago to them now carrying both less-lethal and lethal weapons. Like three years ago, one in three public safety or security officers don’t carry any weapons. Considering the focus by the media and the public on campus active shooter attacks as well as the call for more armed personnel, the fact that there hasn’t been much change is surprising. This may be the reason why more than one in three survey participants have been in campus policing, security or emergency management for more than 20 years. Future issues of Campus Safety magazine will dive deeper into the specifics of K-12, higher education and healthcare security, public safety and emergency management staffing issues. In the meantime, check out the slideshow to see the survey result graphics. 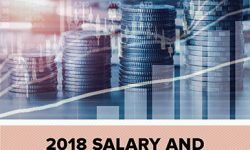 CS wishes to thank the more than 700 school, university and healthcare protection professionals who took our 2018 Salary Survey. We truly appreciate your input!